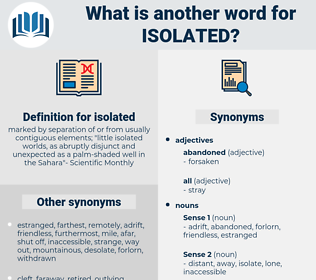 What is another word for isolated? separate, scattered, one-off, occasional, isolating, distant, localized, one-time, marginalized, sealed, outermost, piecemeal, helpless, unique, quarantine, independent, far-flung, point-in-time, incidental, specific, fragmented, disjunct, enclaved, landlocked. alienated, identified, contained, apartheid, dismissed, Were, sacked, Of, fired, sealed, independent. consolidated, dissociated, located, designated, encapsulated, allocated, nominated, disconnected, detached, Generated, removed, restricted, Enunciated, Ostracized, encircled, Toppled, Expelled, assembled, Aggregated, completed, ostracised, discovered, confined, withdrawn, settled, recognised, identified, acknowledged, Compiled, detected, contained, Caught, deposed, offset, recovered, Excluded, severed, information, determined, appointed, Obtained, finalised, treated, besieged, revealed, regrouped, considered, limited, recognized, left, divided, developed, combined, trapped, derived, deprived, sidelined, dismissed, surrounded, moved, broken, embodied, recorded, Achieved, sieged, parted, concluded, spotted, merged, placed, accompanied, Excised, cornered, spread, marooned, stranded, finished, extended, Gained, Been, ended, Viewed, Earmarked, Deemed, Regarded, earned, Pooled, divorced, Fitted, grouped, drawn, signed, cultured, seen, sorted, produced, framed, found, Reached, fired, Bundled, separated, cut, named, scattered, marginalized, sealed, fragmented, enclaved. 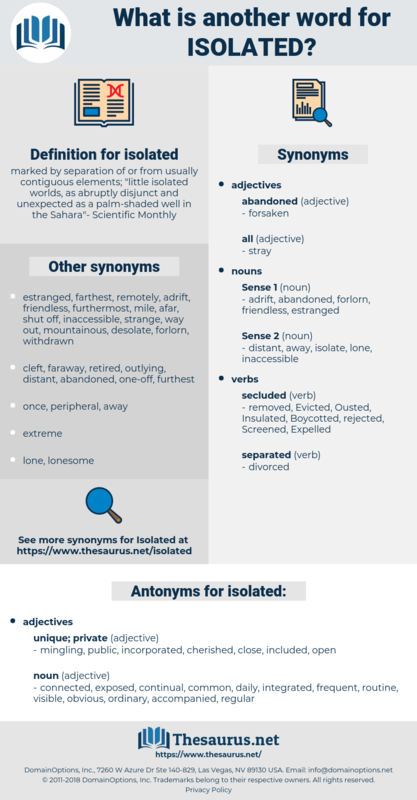 separated, stand-alone, secluded, individual, isolationist, reclusive, outlying, self-contained, lonely, incommunicado, insular, anecdotal, peripheral, discrete, sole. mingling, public, incorporated, cherished, close, included, open. connected, exposed, continual, common, daily, integrated, frequent, routine, visible, obvious, ordinary, accompanied, regular. Darkly as his memory is stained with isolated crimes, Constantine must for ever rank among the greatest of the emperors; and as an actual benefactor of mankind, he stands alone among them. And again, Though the arts are in some respects isolated, yet there is one which seems to profit by the resources of all, and that is Poetry.